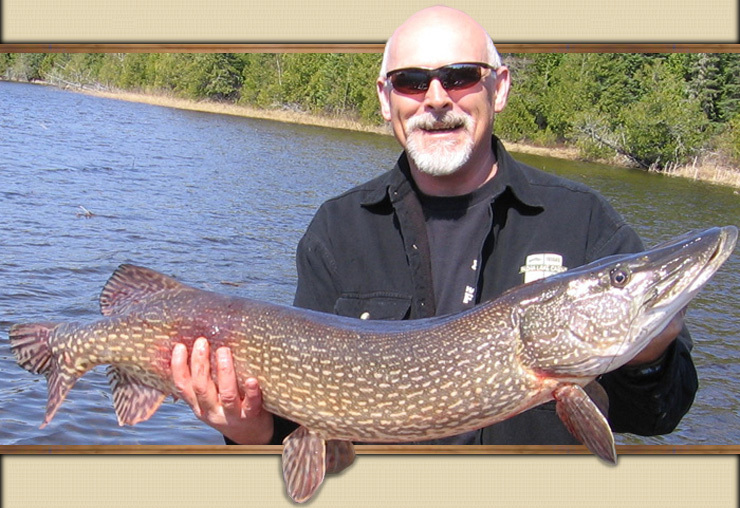 Small to medium size Northern Pike generally stay in thick weeds and close to shore. They will stick to the back of bays where water warms up quickly with the morning sun and they have lots of weeds to hide in. 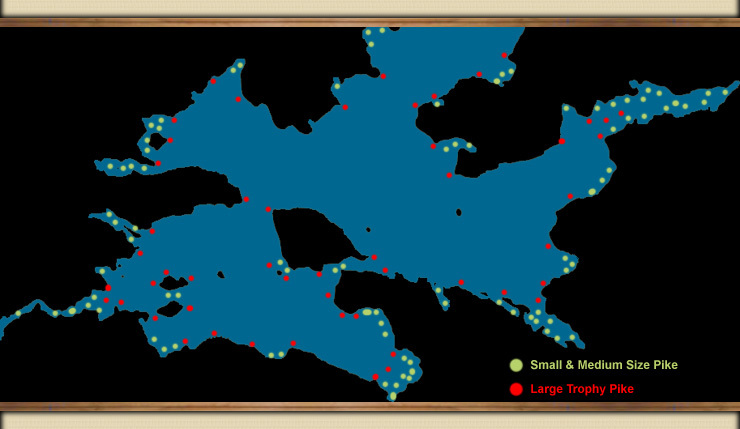 You can find big Trophy Northern Pike in the back of bays and in thick weeds as well but generally the really large Northern Pike are more likely to hang around points leading into bays, narrows between islands or in river current. They need breathing room and like to ambush bigger prey like Walleyes. They like to hang around areas where Walleyes are migrating through. Northern Pike hit just about anything that moves. The best lures to use are lures that come out of the fish’s mouth easily without harming the fish like Dardevle and Spinner baits. Mind you, over the last 30 years so many people have been using Dardevles for Pike fishing that many Pike have learned to stay away from them on some lakes. They are still considered the top Pike lure by most people. Many believe the red-&-silver Dardevles works best in clear water while the yellow-five-of-diamonds Dardevles work best in murky water. Dardevles have also been called DareDevils but the proper spelling is Dardevle. Fly-fishing for Pike is also gaining in popularity. Fisherpersons are finding that you can cast your fly into small open patches in the middle of thick weeds and pick up Pike that are not practical to go after with traditional lures. Fly-Fishing looks cool and romantic on TV commercials and movies but it’s a lot harder then it looks and can be a very frustrating way of fishing if the pike are under shore cover like large over-hanging trees. Flies are also dangerous to the fish because they get swallowed way down where it causes more harm to the fish. If you are going to fly-fish, please use large barbless Pike flies. Top-Water fishing for Northern Pike with a Hedon Spook is an art form that seems to have been lost and needs to be carried on to the younger generation. There is no fishing method for Pike that is more exciting then Working the surface with a Spook and getting those Monster Pike splashing at the surface. Over the years I have seen people try to fish with Spooks and they just can’t get it right so we are going to show you the most exciting Pike fishing method known. Since I have not seen anyone beside myself use a Spook since the early 80s, I think it’s time we get people back into them. 1st) You have to cast your Spook out. The perfect spot to cast a Spook is over-top a thick weed bed that is just under the surface, in between patches of lily pads or along side Bulrushes. The whole purpose is to be able to fish in places that are not practical for other lures. 2nd) Once your Spook hits the surface, don’t start reeling in yet. Give it a couple of yanks so it makes splashes on the surface like a wounded frog or bird. Many times the Pike will hit the Spook before you start reeling in. 3rd) This is the tricky part. You have to hold your rod up as high as you can and pull the line tight so your fishing line is not in the water or even touching the surface. Your line has to be out of the water or the Spook will not make the proper motion when you reel it in. Start to reel in slowly at a constant speed. While reeling in you have to jerk your rod every second. When you jerk your rod, the Spook will slide to one side. When you jerk it again, it should slide to the other side in a crisscrossing motion. You have to get a rhythm going. As you are reeling in, your Spook splashes from side-to side and this drives the Pike crazy. Below is an animation showing the motion that your Spook should be exhibiting. Who says there's no fish in Pasha? Our mission is to provide our guests an adventure orientated, multiple species, remote north western Ontario experience that accesses the most pristine fishing, abundant hunting and remote wilderness resources, while at the same time, providing impeccable service and competitive value. Who says there’s no fish in Pasha?